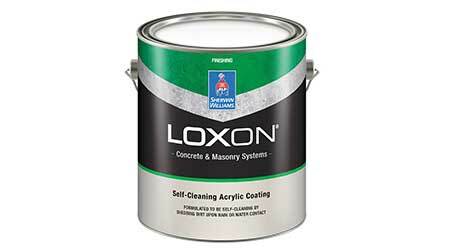 Loxon Self-Cleaning Acrylic Exterior Masonry Coating is engineered to keep properties looking fresh and attractive with a self-cleaning formula that sheds dirt with rainwater or a hose. With excellent weathering protection, the breathable paint reduces potential for coating failure for an attractive, flat sheen that is tintable in a wide range of colors. The high-performance coating helps to avoid costly repaints and extensive cleaning, while meeting the most stringent VOC regulations. Apply Loxon Self-Cleaning directly to fresh concrete (at least seven days old) down to 35 F.